Originally referred to as Grand Canyon, Fredrick Schwatka renamed it in July of 1883 Miles Canyon after General Nelson Miles. Schwatka wrote, “Through this narrow chute of corrugated rock the wild waters of the great river rush in a perfect mass of milk-like foam, with a reverberation that is audible for a considerable distance.” Although accounts differ as to the ferocity of the rapids, there is no question that they were very dangerous. During the Gold Rush, hundreds of boats loaded with precious supplies were lost (as well as several lives) before the Northwest Mounted Police arrived to regulate traffic. Eventually a wooden rail system around the canyon eliminated the need to battle this hazard. 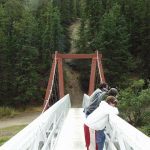 The hydroelectric dam constructed to provide power to Whitehorse has tamed Miles Canyon, but drifting through its 50-foot high basaltic walls is still a thrill. 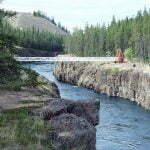 The suspension bridge across Miles Canyon was built in 1922 and dedicated by Governor General Lord Byng. Lowe came to the Yukon in 1899 and had mining interests in the Whitehorse Copper belt and a successful cartage business. Robert Lowe became a long serving local and territorial politician. 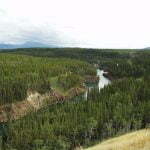 The Miles Canyon area is minutes away from downtown Whitehorse.